The recent "No Make-up" selfie charity campaign has made me fall back in love with the minimal make up routine. Not only is it a time saver but it is also better for your skin. 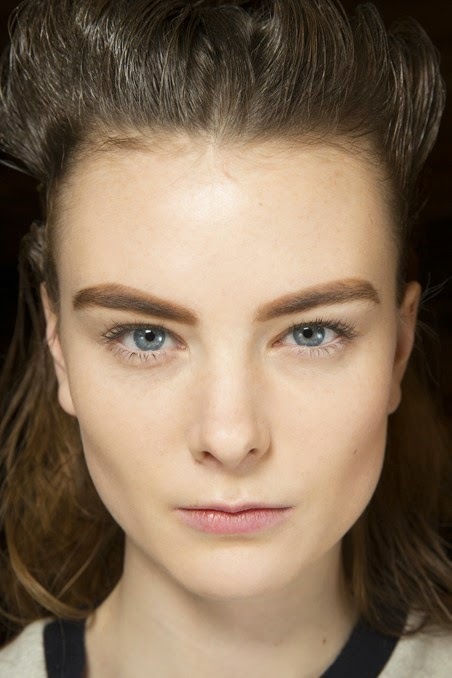 I admit, I don't go completely bare... this "nothing but the brows" look, seen at Phillip Lim A/W '14, reflects the kind of look I go for. I had been told that when deciding on how you're going to do your make up, you should "aim" to highlight one feature... so brows it is! You only need 4 products: BB cream, complexion powder, eyeshadow and lip balm (possibly a 5th item - concealer) and you're good to go. I have found the Garnier BB cream works wonders as a light coverage foundation which gives a natural glow. For my brows I use an eyeshadow from the Naked 2 Palette by Urban Decay (I switch between "Snakebite" and "Busted") to build up on the intensity of my brows. Any eyeshadow that's similar to your brow colour would do the trick. A lick of lip balm and a light dusting of powder and you're good to go! Wow! This is no make up!! You have lovely skin I must say.